I've decided I seem to be a bit of a pessimist at the moment whilst the husband is the optimist. It could be worse - we could both be self pitying, negative individuals. The problem lies with me. Clearly. I see a situation - I look for the bad in it. He sees an outcome - I see a difficult journey. He looks ahead - I'm stuck in the here and now. He has big goals - I get frustrated that we're not there now. He takes it bit by bit - I get impatient. He sees the tough times as being short term - I panic that I can't get what I want now. He's under stress he keeps it contained - I'm under stress I blow like a freaking erupting volcano. Is this an example of yin and yang? Is it just that I'm a realist, and maybe actually a little bit boring, who needs to go and free base jump off a high cliff to liven up? Do we need both in this world to succeed? I am a optimist but a worrying optimist! I feel I have to look on the bright side as my husband is more like you! Ironically we have just come out of a meeting, in front of us was a huge pile of negative things but before we moved on, and you would be proud I stopped and said actually there have been some positives and I listed them too. I am a pessimist - it makes me feel extra happy when something I think will go wrong turns out ok! I like your thinking Annie! 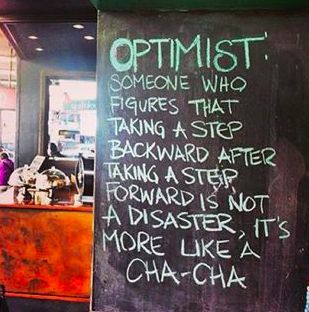 I am a optimist! I believe 'never give up' and one day your dream must come true. Did you see the programme about being an optimist "All in the mind:Happiness and Optimism". I thought it was an interesting programme. I'm a bit of a pessimist in a lot of situations, but can be optimistic in others. 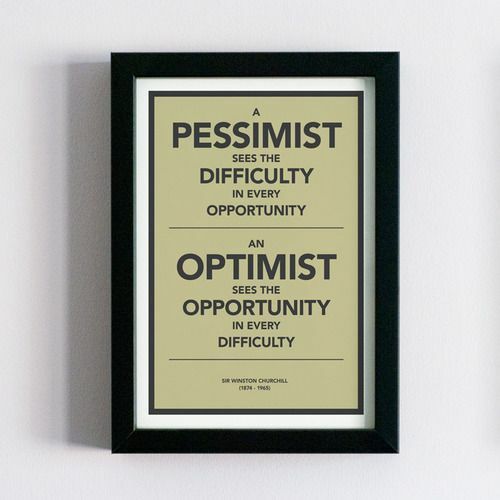 This programme pointed out how you can become an optimist. It's not all in the genes. fascinating. I'll try and find it. Sounds interesting! Hello! I've nominated you for a Liebster Blogger Award for your beautifully written blog. http://noemptywords.net/2014/10/04/award/ Thoroughly well deserved.